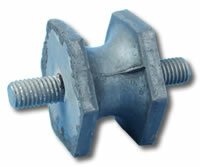 Hexagonal 2 bolt bobbin mountings are available in four sizes with two hardness options as well as custom designs. Hexagonal bobbins are suited only to applications where the primary load is in vertical compression. Typical applications for hexagonal bobbins include vehicle engine mountings, instrument panels, shock mountings, conveyors, hoppers, generator sets, fans and electronic instruments. The hexagonal fittings allow for tightening with a spanner.